We enjoy nothing more than rustling up a nice meal or doing some baking in the kitchen, but every so often it’s nice to treat yourself and have a bit of a lazy one. While this may often mean eating out at a restaurant or grabbing something from your local takeaway, you can also have a lazy one by dining in. Supermarkets are continuously trying to outdo each other in their meal deals for two, and tonight we spotted a great deal in M&S that we just had to grab and enjoy. 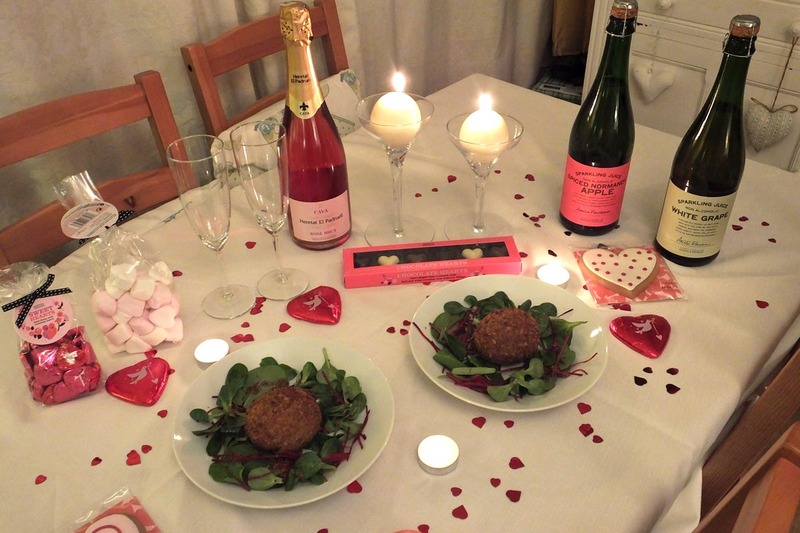 It was the M&S Valentine’s Day meal deal offer. So this weekend, forget about paying over the odds for a table at your local restaurant (although there’s nothing wrong with that), and head to M&S and check out their meal deals; you’ll certainly be impressed. There are some really good meal deals out there, and no doubt this weekend the competition between the big hitters will be fierce. 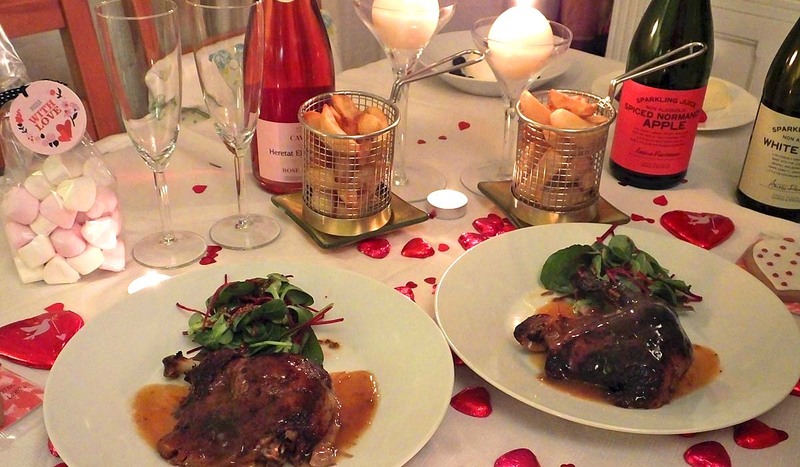 If you want something that delivers that a restaurant quality dish for a fraction of the price, straight to your home this Valentine’s weekend, then Marksie’s is what you’re after. For only £20, you get a starter, main, side and dessert for two, as well as a bottle of wine or cava (or soft drink) and some chocolates. This is an amazing offer, and as somewhere that has really built a reputation on the quality of their food, the range of foods on offer for your Valentine’s Day meal deal is great. Here’s a run through of the dishes we enjoyed. We’ve shared with you our recipe for a chorizo scotch egg in the past and this runny poached scotched egg with pork meat was delicious. Honestly, we were so surprised at how good this tasted. Simply remove from the box, pop in the oven for 12 minutes and enjoy as your starter. We served it with some mixed leaves, shredded beetroot and a honey mustard dressing. A great way to start any meal, especially one your creating in your own home. 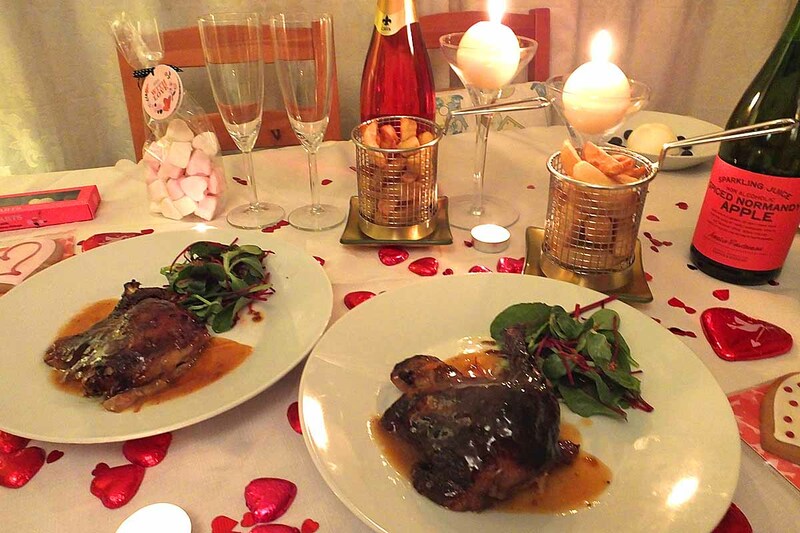 We do love duck and one of us will often get it if it’s on the menu at a restaurant on a night out. With pork belly, rack of lamb, rump steaks and seabass just some of the mains available, there’s certainly plenty of great choice when it comes to the main course, but duck was the winner for us from the start, and we weren’t disappointed. The duck takes about 35 minutes to make and all you have to do is pop it into a baking tray and leave to cook. While it’s cooking you can relax and start on your bottle of wine. You can enjoy a side course with your main course and we decided to go with the chunky chips from the gastropub range. 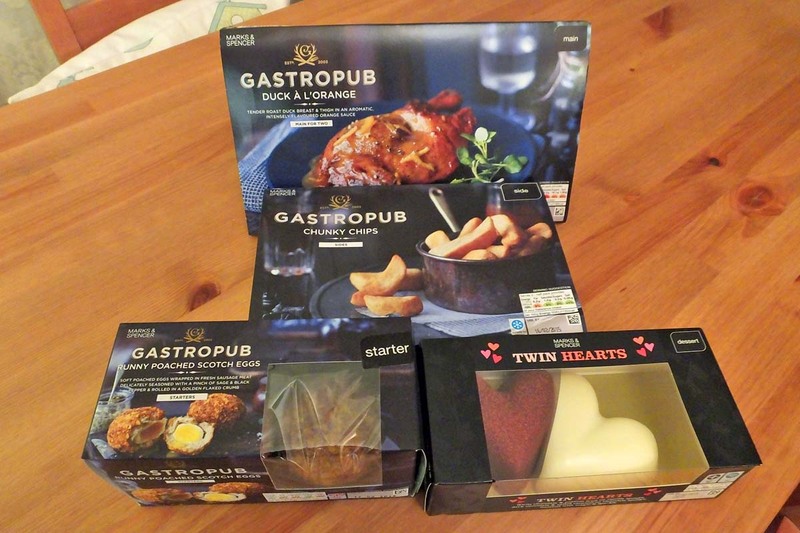 Indeed all our dishes were from the M&S gastropub range. The chips only take about 20 minutes to make in the oven so it won’t be long until you’re tucking into your tasty Valentine’s Day meal. 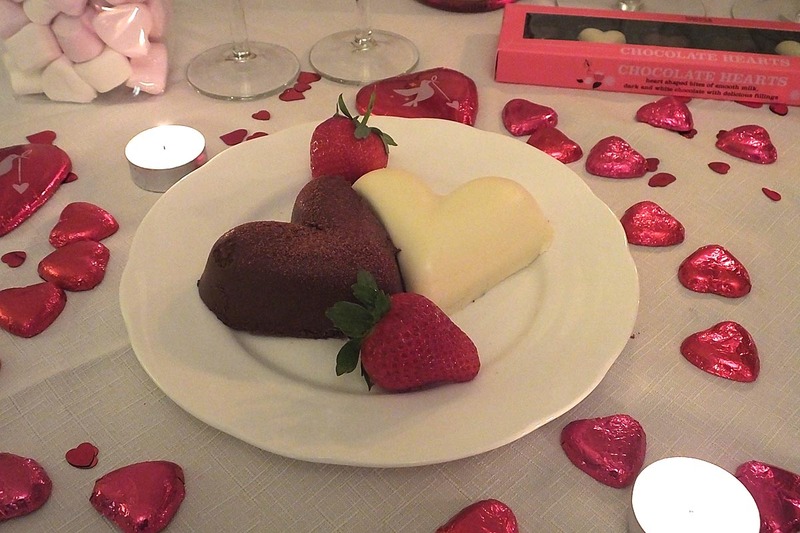 The real romance in a Valentine’s Day meal is in the dessert. Think chocolate and strawberries. This dessert just screams love and it tastes as good as it looks. The white chocolate heart comes with a passion fruit and vanilla sponge while the dark chocolate one is flavoured with salted caramel. Two winning combinations and the perfect way to finish your meal. Well, that is of course until you start to tuck into your wine and chocolates. 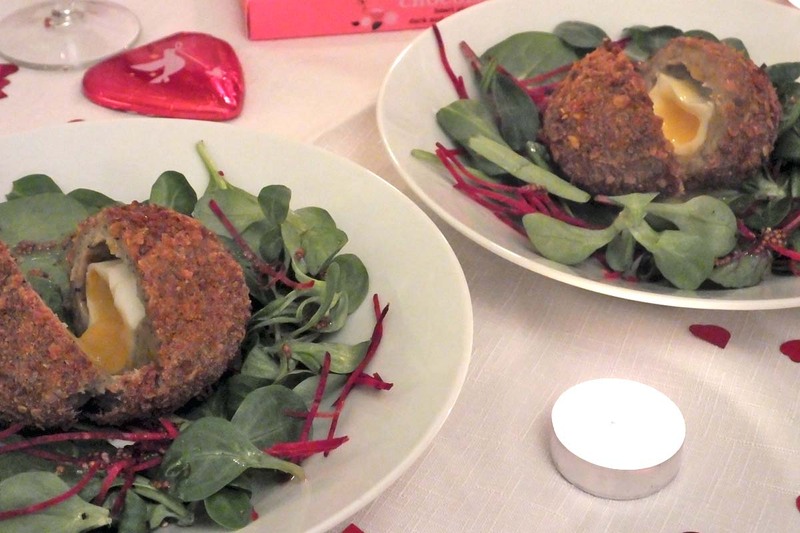 There’s so much great choice available in the M&S Valentine’s Day meal deal that we might even go back for a second helping before Saturday. Check out the full range of starters, mains, sides and desserts, as well as your wines by clicking here. They also have a great range of treats on offer; good news for those of you who have left it to the last minute this year. 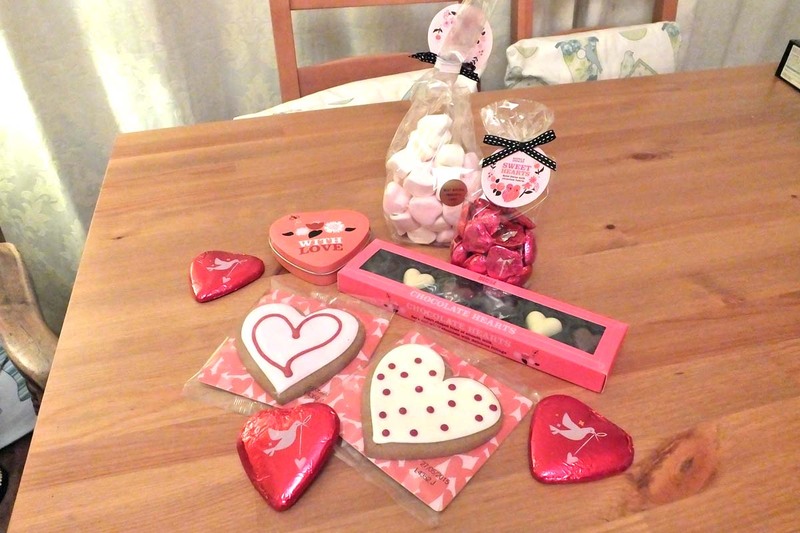 Do be sure to connect with us on Facebook and Twitter to see what Valentine’s Day treats we rustle up in the Pikalily kitchen. The big question in our house at the minute though is – who’ll be doing the cooking?